Our fudge is hand-made in large open copper pans, stirred with an enormous wooden spoon. 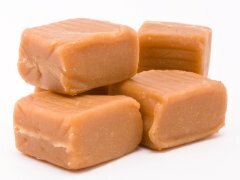 We continue to stir our fudge whilst it cools, to achieve a smooth finish (to do with the forming of crystals). Our clotted cream comes from the lovely Craigs family whose cows roam the coastal fields just east of Weymouth.